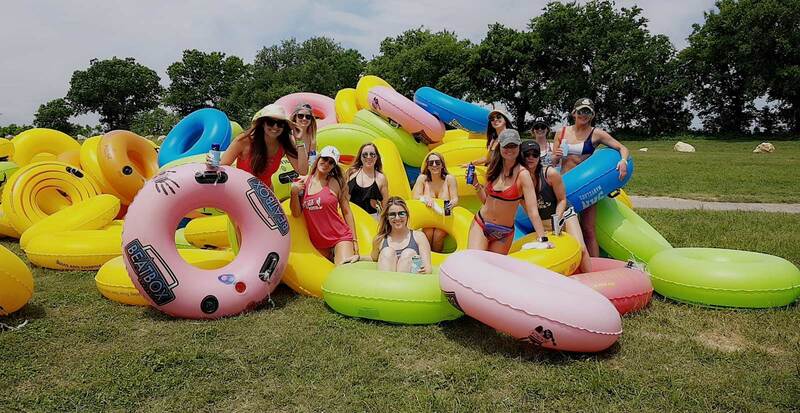 River Tubing New Braunfels TX - Go on a Tubing Trip! All trips bypass line to get you on the river and drive you there and back in an SUV, Van, or for larger groups your own Party Bus where the fun continues. Alcohol is allowed in all of our air conditioned vehicles! A PEAK AT New Braunfels TUBING! FYI: With most other companies you must have large group for private trips. Not only is our competition more expensive for both private and public trips, but they use normal non alcohol allowed school buses without AC. *All prices include everything but 15% Tip & Fees. We were the first, and we’re still the best. Our competition uses normal and old school buses without AC. All of our vehicles have AC and for larger groups we use party and coach buses! Our Make New Friends Trip is $54 per person, and our Door to Shore private trip is $69 per person. We organize everything and pass on our savings we receive from doing lots of trips onto your group. Not only is everything included in the private package price like cooler setups, but you also get a ride where drinking is allowed to and from venue in a permitted vehicle, all for a great price. We do so many of these trips during the summer that we know how to streamline the process, and you save on transportation costs since this is our specialty. Not only is it all a great deal and you do not have to worry about anything other than putting on sunscreen, but it is also the safest option. Why risk driving home after having a great time? Instead, enjoy yourself and go with the best and let us take care of the rest. From door to shore we’ve got you covered. Private Trips: For pricing information and to reserve an all inclusive tubing experience with ride in your own private chauffeured alcohol-allowed permitted vehicle with pickup from your location, just fill out the form below or call or text 512-655-3085.